Home First SIGGS Strategic Workshop a success! First SIGGS Strategic Workshop a success! On 13 April 2016, the SIGGS Project organised the first SIGGS Strategic Workshop, in Vilnius, Lithuania. 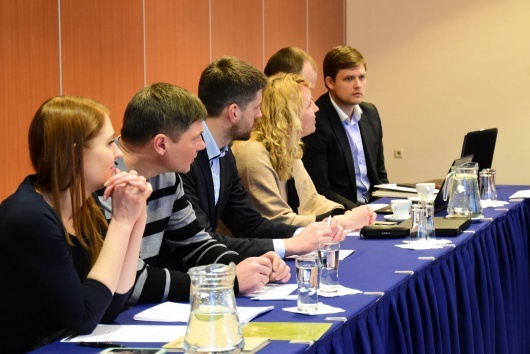 The Workshop was attended by 20 participants from 7 national federations (including handball, rugby, shooting, rowing, volleyball, equestrian and hockey), the National Olympic Committee and the Lithuanian Union of Sport Federations. The Workshop was officially opened by the President of the National Olympic Committee, Mrs Diana Gudzinevičiūtė, who welcomed the participants and stressed the importance of implementing good governance principles. Following this welcome, Valentin Capelli and Matthias Van Baelen of the EOC EU Office presented a short introduction into the topic of good governance followed by an explanation on the objectives, methodology and activities of the SIGGS Project. Particular emphasis was put on the functionality of the Roadmaps and Action Plans which have been developed over recent months. Consequently, Aurélien Favre of EOSE presented the results of the first evaluation round that took place in October-November last year. In total, 10 Lithuanian sport organisations participated in the evaluation that was sent to 14 organisations. Afterwards, two organisations presented their experiences with good governance in Lithuania. The Lithuanian Rugby Federation presented under the title “rising power” an interesting process that started in 2013. With small steps towards professional management and administration, they have managed to double the number of club members and to significantly professionalise the structure. In particular in financial arrangements and strategic planning, important changes have been made that lead to more financial capacity and better sportive results. The example has also been included in the Roadmaps of the SIGGS Project. The second presentation was conducted by Agne Vanagiene of the Lithuanian Union of Sport Federations. She presented a research done in the framework of a MEMOS dissertation on the implementation of good governance in Lithuanian sport. During the afternoon session, small group discussions were organised to evaluate the information provided earlier and to discuss the situation in Lithuanian sport federations. The discussions were structured around the question how to improve risk management, gender equality and liaison with athletes in Lithuania as the evaluation has shown that improvement can be made in this regard. They also touched upon how this could contribute to the activities on good governance planned at national level by the NOC and the Lithuanian Union of Sport Federations. Finally, the second version of the self-evaluation tool was launched with the option to consult the different Roadmaps and to obtain a customised Action Plan. The SIGGS Project management would like to thank the NOC of Lithuania once again for organising and hosting this first successful and very fruitful Strategic Workshop. The next Strategic Workshop is scheduled for 4 May 2016 in Lisbon, Portugal!